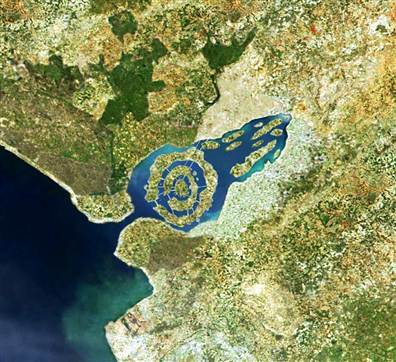 Buried in the vast marshlands of the Dona Ana Park, lies what researchers believe could be the ancient, multi-ringed city of Atlantis in the mud flats of southern Spain. From the time of Plato’s writings, the Enigma that is Atlantis has intrigued & confounded experts and layman alike. If this dominant economic and militant force of the ancient world truly existed why is there so little evidence to prove it? Can we look at the story of Atlantis and find evidence of Biblical accounts of the Book of Genesis, namely the great flood of the Bible? As some historians suggest the ancient Atlanteans were a sea faring peoples determined to map the earth and the stars above. Some circumstantial evidence of this may be found in the maps of the ancient sea kings, such as the mysterious piri reis map which describes an Antarctica free of ice long believed before the time of its discovery. Discoveries at several off shore sights in the Mediterranean point to a well established Atlantean coastal empire that may point to not only its existence but also its burial by Sea. These findings indicate that this ancient civilisation founded by the mythical figure of Atlas possessed highly advanced navigation methods and nautical skills which allowed them to successfully measure and map the Earth. Thereby allowing them the ability to traverse the globe establishing an global empire that was wiped out at the end of the ice-age. It is part of the historical record that the end of the last ice age was around 12,000 years ago. The earliest surviving source of the story of Atlantis is the Greek philosopher Plato. Plato and his learnered contemporaries knew nothing of ice-ages, but nonetheless set the demise of Atlantis at this precise date. There are over 200 known sunken cities in the Mediterranean. These ruins are prolific megalithic constructions that are very distinct, indicating they were erected by the same civilisation during the same architectural period. From the great pyramid of Giza to Stonehenge in England and to Baalbek, megalithic building with gigantic sculpted stone is considered by academia to have begun around 2500BC. This construction method can be found throughout the ancient world in Greece, Spain and even South America indicating a central source. Plato described Atlantis 2,600 years ago, as an island in front of the straits which were called the Pillars of Hercules, but are now known as the Straits of Gibraltar. There have been significant discoveries here of submerged megaliths off the coast of southern Spain, off the shores of Lixus Morocco, West of Gibraltar, Tarifa, Cadiz, Rota and Chipiona. All within this same region. A team of American researchers analysed satellite imagery of a suspected submerged city just north of Cadiz, Spain. 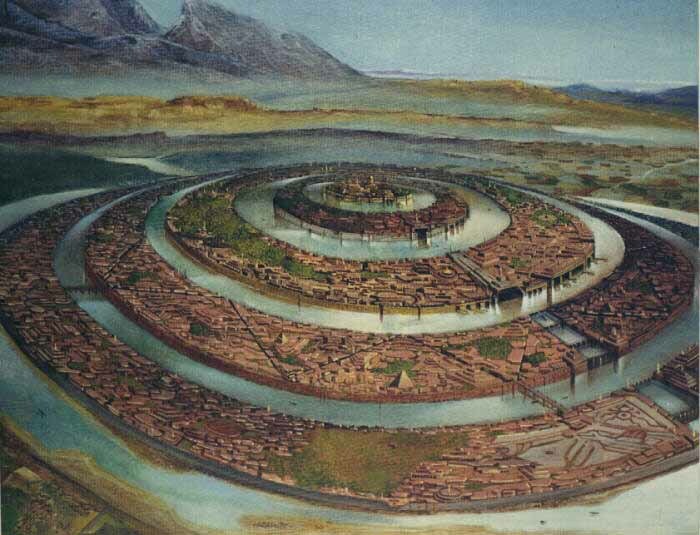 There, buried in the vast marshlands of the Dona Ana Park, they believe that they may have pinpointed the ancient, multi-ringed city of Atlantis. Atlantis was an ancient seafaring culture with advanced knowledge of astronomy, global mapping and complex mathematics. 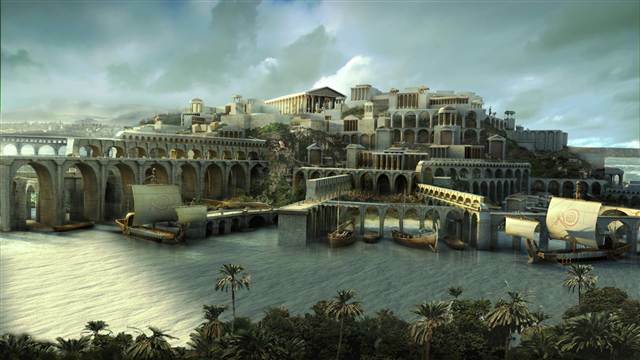 According to Plato the City of Atlantis was a port city with concentric canals leading to an inner city and port. The city of Carthage built in Tunisia by the Phoneticians was an identical if smaller version of this building model. Discovery in central Spain of a strange series of memorial cities, built in Atlantis’ image by its refugees after the city’s likely destruction by a tsunami also point to the idea that survivors of the catastrophe ventured out into the world and passed down there knowledge to other cultures. What little evidence we have points to Atlantis as being a maritime civilisation, not unlike the ancient Phoneticians, connected together by a globally distributed network of coastlines. The reason there is so little evidence that historians will accept is because those coastlines have long since been submerged with the rising of the oceans, and are not being seriously explored. Influences of a great lost civilisation can be found in the Mediterranean and the Eastern side of what is now called the Atlantic ocean and this is the most likely candidate for an advanced culture which is now believed to have been destroyed by tsunami. If these findings prove accurate and the sunken ruins prove to be Atlantis dated correctly, then the discovery will challenge, if not destabilise the prevailing Scientific theories of the Age and Advancement of Modern Humans.